From an online community on Facebook helping people with their basic queries around fitness and nutrition to launching diet and wellness centres across the metro cities and now stepping into the mobile world, Pune-based online fitness consultation platform, SQUATS has come a long way. 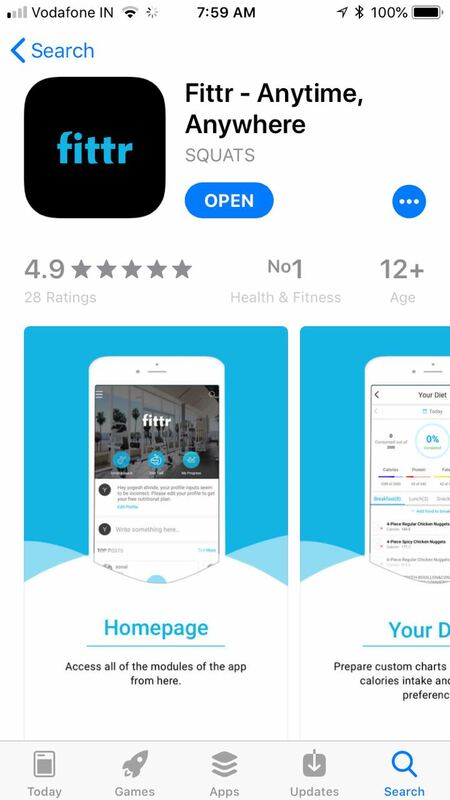 Underlining its commitment to providing an integrated platform for all the fitness enthusiasts to plan their customised diet, fitness and wellness regimens, it has recently launched a mobile app, FITTR app. Available on iOS and Android, the app received 5.5K downloads in India within the first night of its launch through iOS and remained on the top position. SQUATS is now expecting 20K-30K downloads by the end of the first month of the FITTR launch. Boasting of a simple and user-friendly interface, the FITTR mobile application promises a smooth and hassle-free experience through a vast set of features that enable the users to make the most of its services. The app offers automated diet charts, BMR analysis, quantified food details, weekly diet chart planner along with healthy food recipes. Once the user feeds in the required data like his/her age, weight and other health details, the app automatically generates a plan based on the information shared. Users can also opt for a complete transformation package and book an appointment with a SQUATS Nutrition and Fitness Consultant dietician as per the time slot listed on the app. Catering to college students yearning for six-pack abs to a 70-year old aspiring to stay active and fit, SQUATS has 450,000 retained members reaching out to them online. The newly launched app- FITTR- through its comprehensive services is sure to emerge as a one-stop shop for health and fitness services. SQUATS began as a revolution on Facebook in 2016. Initially, the idea was to address the challenges in the fitness industry where lack of information, trust, satisfactory results, quick-fix solutions, and fad diets were affecting its reputation. Eventually, over the last 24 months, the platform’s integrated online and offline presence has helped SQUATS in implementing a different approach to help the members by providing them with the right knowledge to community support, mentorship and guidance by its team of 130+ consultants. Currently, apart from its mobile debut, the platform is on its way to open 10 centres by the end of this financial year and targets +120 centres by 2020 aiming to reach out to those who prefer face-to-face counselling. Meanwhile, the centres in Pune, Hyderabad, Bangalore, Mumbai, Delhi and Raipur have already started operating.